As I alluded to in an earlier post, my husband recently returned from a business trip to Japan, where we lived for two years. Since I wasn’t able to join him on this one, I asked him to take some photos of the bicycle infrastructure there to share. As a caveat, I never cycled in Japan myself – I’m not sure why, except that it never really seemed necessary. We had a car and lived close to the subway station, and at the time that covered the bases. So this is observational rather than experiential data. The center of the photo is, of course, the roadway for vehicles. To the left and right, you can see a narrow median which separates vehicular traffic from both cyclists and pedestrians. 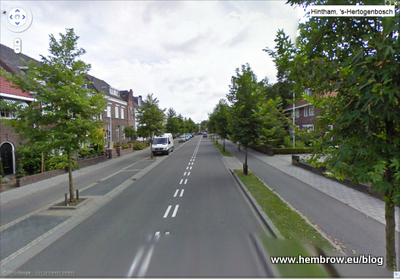 You can see that there is separate space for both people on bikes and people who are walking in the non-motorized area. This is BEAUTIFUL, and the gold standard, and I love it. I’m also not aware of anything comparable in the United States, anywhere (though I’d love to know if you do). Considered too expensive, perhaps? If we’re not willing to require sidewalks on both sides of the road in many of our more recently-developed areas, this type of infrastructure seems like a pipe dream. 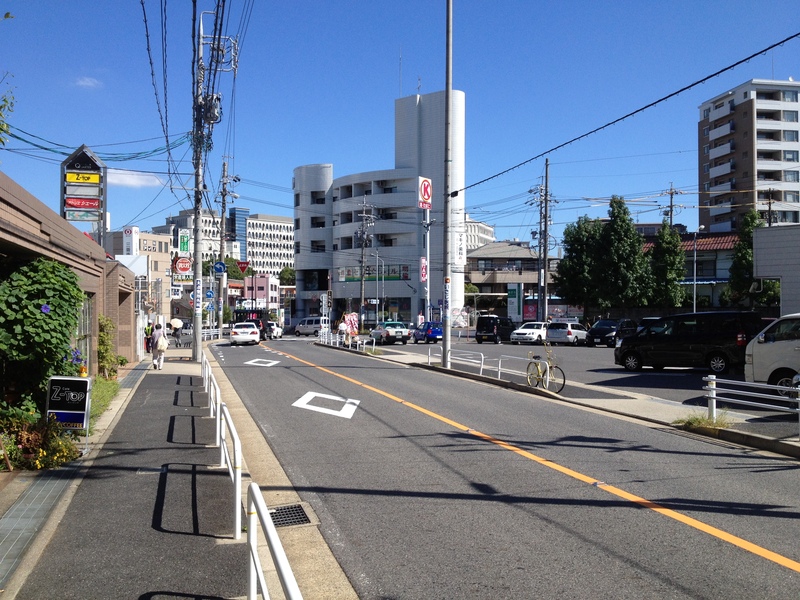 Japanese cycling infrastructure is less differentiated. This first photo shows the most common scenario, as I recall, which has people on bikes sharing space with people who are walking. The Japanese are practiced cyclists who excel at sharing space, and those on bikes almost universally rode slowly enough to maintain the safety of those walking down the street. This is more similar to what we currently have in America, with a defined street/automobile zone and not-street/pedestrian zone. The big difference is that the sidewalks are often much wider and the crosswalks are well-marked. This next photo is a variation on the theme. In some places, the sidewalk is divided into separate walking and cycling zones; in practice, I don’t know that I ever really saw anyone paying an ounce of attention to the separated zones (which is why I find this picture a little funny – I wonder if this guy intended to be in the bike lane!). This is coming from the residential area* where we lived to the neighborhood center in Yagoto. It’s a route that I walked often, so I’m well-acquainted with it. Although the sidewalk is narrow, it is used by both pedestrians and slow-moving cyclists. It’s not unlike an American street, except that there are protective guardrails between vehicular and foot traffic. This isn’t really a small thing: having a physical barrier between myself and traffic made a tremendous difference to my perception of safety. It is NOT beautiful, but it is functional. I think what makes this work is that Japan is PEDESTRIAN friendly, and what’s good for pedestrians is often good for bikes, as well. People in cars are always, always, ALWAYS looking for people traveling on foot or by bicycle. Part of this is due to the extraordinary number of people who get around this way; part of it, perhaps, is that the consequences of hitting a pedestrian are dire. A friend of mine hit a pedestrian while driving in Japan, and was so traumatized by the experience that she will never drive there again (understandably so!). As compensation, she was asked to visit the victim every day in the hospital, write a formal letter of apology, and pay a painful fine. No slap on the wrist, here. Tokyo by Bike has a great article on cycling in Japan that unpacks the experience more than I’ve been able to do here; I recommend heading over there if you’re interested in more details of what seems to make their system work. Click here to go right to the article on Japanese bike parking, or here for a view of one narrow Japanese street. *What I’m calling a residential area in Nagoya is completely unlike our residential areas here. As far as I can tell, they always default to mixed-use. This means that although there will be predominantly filled with single-family homes, townhouses, and apartment blocks, they also have businesses spotting the landscape and are interspersed with business districts, especially along the busier streets. We had two grocery stores (one comparable to D&W, and the one in Yagoto comparable to Target) within a 1/2 mile of our house and a convenience store right on the corner, but this was definitely an area where people lived rather than worked. Florian, that’s certainly true, and it’s strange to me, as well – that in a country where people wouldn’t dream of crossing the street against the light, there is near-complete disregard for bicycle/pedestrian lanes on walkways. And yet, most of the time it seems to work so well. The only incident I remember from my time in Japan was when my mom was hit by a slow-moving high school student in Kyoto – and I that because she reflexively stepped in the same direction as the person on a bike trying to avoid her (since of course traffic travels on opposite sides of the street in Japan and America). I’m intrigued by how, somehow, this behavior we consider dangerous seems to work. It still really freaks me out on a regular basis – one of the few things I can’t get used to. I’ve never been hit by a bicycle (or a car… who ignore crosswalks on a regular basis), but it was close dozens of times. As in “being touched by the cyclists clothing” close.